In my home state of Minnesota, we are having an urgent debate over the future of one of our major sports franchises. As we work through the options, it is critical that we adopt a Strong Towns approach. Whatever public dollars are committed must leverage the billions of public dollars we've already spent -- and committed to spend -- maintaining our existing highways, streets, parking ramps, transit lines and other infrastructure, money we are finding increasingly difficult to find. Some background for our many non-Minnesota readers. The hometown football team, the Minnesota Vikings, currently plays at Mall of America Field (formerly the Hubert H. Humphrey Metrodome, a name that went out of style when it was discovered that Mr. Humphrey's estate was not going to pay as much as MOA for the privilege of having their namesake be a stadium nobody wants). For a variety of reasons -- none of which are that important to this discussion -- the Vikings would like a new stadium. Significant portions of Minnesota's political class would like to help them build one. Since the MOA Field lease expires after this season, there is a sense of urgency to get a deal done. I'm going to suppress a lot of my unrelated opinions regarding the state of sports franchises, the idea of public subsidies for sports stadiums, the relative necessity and comparative worth of professional sports to a community, etc... There are plenty of other blogs in that space and it's not what we're about here anyway. Let's assume the stadium is going to be built and the cost sharing will be roughly 1/3 state, 1/3 local and 1/3 team. What I'm most interested in is where. There are three options being floated. A site in the second-ring suburb of Arden Hills formerly used by the U.S. Army to manufacture ammunition. The Army decommissioned the site and designated it as "excess property" to be turned over to local governments and/or sold at auction. A new stadium, along with related development, would consume 260 acres, property that would need environmental remediation to make use of. This is the team's preferred option. Renovate the current Metrodome and give it to the team. Build a new stadium on a new site in downtown Minneapolis. Some private landowners are pushing a site currently used for a farmer's market. Let's apply some Strong Towns thinking. We're all about building resiliency here. How do these alternatives make their respective communities stronger, leveraging existing infrastructure investments to obtain a higher rate of return on public expenditures? How speculative are these alternatives and how viable will they be in various market conditions? The first thing to note about the Arden Hills site is its relatively remote location. 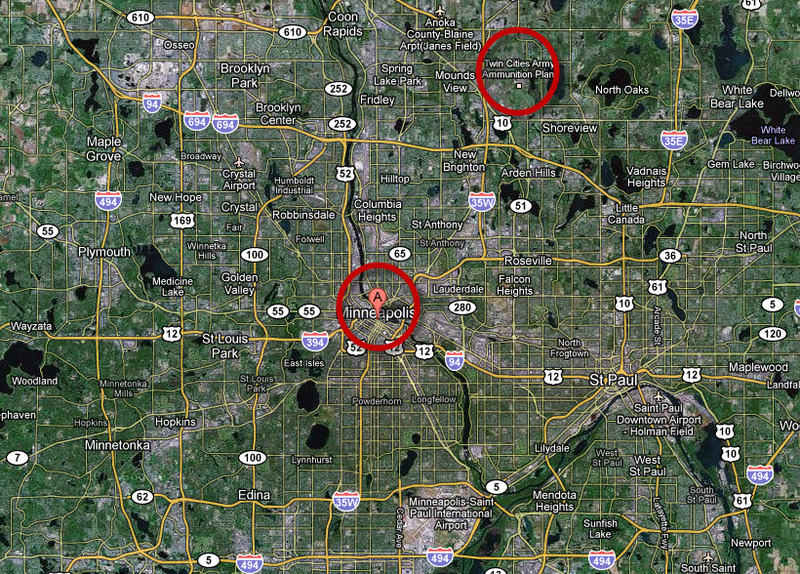 On the following map I've circled Minneapolis and the potential new stadium site in Arden Hills. It's not like this site is close to anything. From Minneapolis or from St. Paul, you're looking at a drive that will be at least 20 minutes in good conditions. From Bloomington -- where the airport and MOA are located -- you are probably at least a half hour away. And it should be noted that a trip by car will be mandatory to the Arden Hills site. Neither of the light rail lines runs anywhere near and neither does our northern commuter rail line. I suppose some special bus routes could be put in for gameday, but the bottom line is that the Arden Hills site does not fit into any current transportation plan. In fact, in terms of using existing infrastructure investments, the Arden Hills site fails miserably. While the numbers fluctuate based on who you talk to (and it seems like some rosy-scenario accounting is being employed), extensive highway improvements will be necessary with the least-expensive number on the table currently being $131 million. The Minnesota Department of Transportation pegged the number at $131 million Wednesday, including $46 million in local road improvements and another $85 million in improvements need in nearby trunk highways like Interstate 694 and I-35W. Initial estimates had put the cost at closer to $240 million. "I think it's a more manageable number," said Vikings vice president Lester Bagley. "I think it's also very important that the governor and MnDOT are trying to work with us on this, and to give us some momentum and progress toward resolution." In contrast, the current Metrodome is on the light rail line. There is a stop at the stadium. You can get on the light rail line in Bloomington or (soon) St. Paul or you can ride the commuter rail line in from the northern suburbs and end up at the Metrodome. The rail lines are coordinated with the bus system, further expanding options. There is a ton of parking currently at the site - no additional parking would need to be built. And while it is obvious, it needs to be stated that many more Minnesotans live within walking or biking distance of the current Metrodome site than will ever live in Arden Hills. Pretend you're the owner of the Vikings with a new stadium in a remote location. You are trying to maximize your revenue per seat. Two years into the new stadium, there is an uprising in Saudi Arabia, a new government emerges there that is not inclined to like us and, subsequently, gas prices spike to $8+ per gallon. At that point, you may wish your fans had some options besides a long car trip. Strong Towns 101 tells us that increasing options builds resiliency. Forget about the owners, though. Let's look at the public's investment. We've already made multi-billion dollar investments in highways, parking, transit systems, sewer and water systems and other infrastructure that serve the existing stadium site and other development nearby. We've already given tax subsidies to some businesses in the vicinity of the current stadium to get them on their feet. We've made other investments in a new theater and library, as well as baseball and basketball stadiums nearby. There is a major public university campus up the street that gets significant ongoing public support. Here's my question: where's the public's return? Minnesotans have made these investments counting on the private sector coming in and capitalizing on them. If we don't get billions of dollars of new private sector investment around these light rail lines, how are we going to make that public investment pay off? If we don't fill in these empty or low-use lots we have and get all our vacant condos and retail space in productive use, how are we going to afford to maintain all this stuff we've already built? Spending public dollars to divert private-sector resources to a remote location while leaving a huge hole in the middle of billions of dollars of prior public investment would not just be counterproductive, it would be an enormous self-inflicted wound. If the private sector wants to invest private money to develop the Arden Hills site, there should be no objections. For public dollars, however, we need to be far more judicious. Another major factor weighing against the Arden Hills site from a Strong Towns standpoint is the speculative nature of the proposal. The current owners are successful real estate developers from New Jersey. By successful, I'm suggesting that they have made money in recent decades developing real estate. It is reasonable, from their perspective, to think that they could develop a 260-acre site profitably based on their past experiences. In fact, their preference for the Arden Hills site is based on that assumption. The team's conceptual plan for buildout of the Arden Hills site. This is a model that has been done successfully before, most recently in Brooklyn with the New Jersey Nets, an example that is not identical, but rhymes. Malcolm Gladwell did a great piece on this explaining how New York developer Bruce Ratner purchased the Nets and proposed moving them to a new site in Brooklyn largely as a way to access the power of imminent domain for his real estate project. Finances forced him to eventually unload the team, but as Gladwell points out, that really wasn't a problem. Did Ratner even care that he lost the Nets? Once he won his eminent domain case, the team had served its purpose. He's not a basketball fan. He's a real estate developer. The Arden Hills site does not require imminent domain. Besides some environmental work (which the team believes will go quickly but others disagree), the site is ready to go. However, there is nothing there right now. This is totally a build-it-and-they-will-come undertaking. The success of this project ultimately depends on many businesses opening or relocating to the site along with many families doing the same. Let's not even debate whether or not this is realistic given the high foreclosure rates and high level of commercial vacancies in the northern suburbs. If you are the team owners, you have faith that the economy will turn around and we'll be back to go-go-growth again. If that happens, they are in position to gain from that. But from a resiliency standpoint, that is a huge gamble. What happens if this winds up to be a boondoggle? A stadium in the middle of nowhere? What if the public sinks $600+ million dollars into this and the only thing we get is a new stadium and a few hundred million dollars of new infrastructure to maintain? What if the market demands something different in the years ahead (as some emerging trends suggest)? As we look into the future, are we really certain it holds so much excess prosperity to take such a huge leap with public dollars? Redeveloping the current Metrodome site, in contrast, is a much sounder public investment. We don't have to bet on future development -- it is already there and happening. While the condo and loft market has slowed down, a lot of units have been built near the current stadium. Even so, there is a lot of room left for even more redevelopment. And none of it will require additional infrastructure. It's all there already, a sunk cost for the public. If we were to redevelop the Metrodome site, the maturing process that has been going on for decades around the Metrodome (enhanced by the recent rennovation of the Guthrie Theater) would continue. The platform for growth is already there. A long-term commitment to the Metrodome site and a new stadium could only be a catalyst for additional private-sector investment. There lies the catch for the Vikings. The new private-sector investment around the Metrodome would be spread out amongst many, not reserved exclusively for the ownership of the Vikings. New development would be the product of many little ideas by many minor investors; comparatively small bets on the future of specific sites near the current stadium. Some of these projects would work great. Some would be less successful. While this lacks the grand vision of the Arden Hills plan, it is far more resilient. Instead of creating a too-big-to-fail situation in a second ring suburb, we would be leveraging a significant public investment for a broader, more market-based and -- dare I say -- natural investment approach. In my TEDx talk and in prior blog posts, I have focused on the urgent need to leverage public sector investments for greater public return. Too often we disregard the ability to create capturable financial value from our public projects. While my comments in those articles have dealt with courthouses, parks and schools, shouldn't the burden for a public return on investment be all that much greater when the public dollars are going to subsidize a privately-owned sports stadium? I respect the governor's desire to create jobs. I respect the Vikings' need for a new facility. I respect lawmakers' need to do something to resolve this situation. None of this absolves us from our obligation -- especially during this difficult economic transition -- to move beyond single-dimension thinking. Any public spending on a new stadium must make Minnesota a stronger and more resilient state. The Arden Hills location does not come close to doing so and should be rejected. The focus of state officials should be on renovating the existing site or finding a nearby site that leverages the same set of existing public investments. That would be a Strong Towns approach.